Imprisoned Barotse leader Afumba Mombotwa sent a message – the first after being transferred from Mwembeshi to an isolated prison – of determination to the people of Barotseland, denouncing the persecution to which the Barotse are subjected by the Zambian authorities. 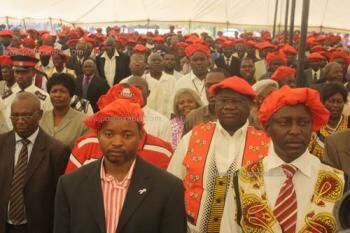 Mombotwa urged the Zambian government to stop using brutal police force against the people of Barotseland in response to their claim for their inalienable rights such as freedom of assembly, freedom of expression, and self-determination, and stressed that state violence will not deter the Barotse in their struggle. Mombotwa, along with three other key Barotse independence leaders, was detained in 2014 after the transitional government of Barotseland was set up as a result of the election of the Barotse National Council. Since a state of emergency was established by the Zambian government last month, opposition leaders and divergent voices among citizens have been strongly repressed by state and police authorities. Imprisoned Barotseland independence leader Afumba Mombotwa has castigated the Zambian state for its continued arrests, torture and imprisonment of the Barotse people as that was neither the solution to the Barotseland quest nor would it stop them from agitating for their homeland. In his first message to the nation since the state forcefully transferred him and his fellow Barotse prisoners, Likando Pelekelo and Inambao Kalima, from Mwembeshi state prison last year to isolated remote prisons of Luwingu, Mansa and Kasama in the northern regions of Zambia respectively, the Barotseland administrator has advised Edgar Lungu and his Zambian government to stop acting so cowardly by sending his brutal police against the largely peaceful people of Barotseland each time they sought to exercise their inalienable rights, among them freedom of assembly, expression and self-determination. “President Lungu should know by now that arresting and torturing or even killing the Barotse will not solve the issue of Barotseland. In fact, it will not even deter them because Barotseland is their only country,” Mr. Mombotwa said in reaction to reported continued arrests and torture of many Lozi people over the issue of Barotseland. The visibly relentless Mombotwa further advised his team of leaders, Linyungandambo, BNFA, the youth and all Barotseland citizens to stand firmly encouraged and remain defiant against what he termed ‘black-on-black’ colonization which was as brutal, if not more, than white colonization, stating further that the British were at least civilized enough to pack and go when their time had come. “Please, take my warmest greetings to the entire people and nation of Barotseland, including all our supporters and sympathizers across the world. I wish to encourage all my colleagues and the loyal citizens of our great nation to remain defiant and continue to defend the sovereignty of our country,” concluded Mr. Mombotwa in his relayed message to the nation from his Luwingu prison cell. The Kingdom of Barotseland was lured into joining the new republic of Zambia at independence in 1964 on the condition that it would continue to enjoy relative autonomy under its own separate government through the Barotseland Agreement 1964 treaty which was completed and signed with both Zambia and Britain. However, the Zambian government unilaterally abrogated the pre-independence agreement through various targeted municipal legislation in the periods 1965 – 1969, thereby annulling the 1964 agreement in preference to forcefully administrating Barotseland as a mere province through arrests, imprisonment and sometimes even killing of many Barotse people who called for the honoring of the now defunct 1964 agreement, as Mombotwa and his colleagues are currently serving ten years Zambian jail sentences. In 2012, the supreme Barotse National Council, BNC, unanimously elected for Barotseland’s total independence from Zambia, which resulted in the setting up of a Barotseland transitional government in 2013 headed by Afumba Mombotwa. It was for this act that Afumba Mombotwa and three of his key leaders were arrested, tried and imprisoned as their action was deemed ‘usurping executive powers’ – a treason felony in Zambian law. Under the transitional arrangement, the civil government would work with the monarchy to establish a fully democratized constitutional Barotseland monarchy styled after other progressive constitutional monarchies of the world such as Japan, Netherlands, UK, Canada, Australia and many others, with universal suffrage. The Zambian government, however, responded with increased state reprisals using police and other state security forces, which are now in their thousands across the entire contested territory of Barotseland, ready to suppress any separatist activities. Under Zambia’s current ongoing state of emergency, general human rights abuses against the people of Barotseland are feared to be increasing with mass arrests of separatists likely to rise. Zambian President Lungu declared a state of threatened emergency last month to restore what he termed ‘law and order’ after a spate of fires on property, including the biggest market in the country, were experienced. Since then, however, several opposition leaders and citizens have been arrested more for allegedly defaming or opposing the president rather than ‘terrorist’ activities, validating the accusation that Mr. Lungu perhaps resorted to rule by emergency decree in order to suppress divergent voices, including calls for an independent Barotseland.